Chicago Review Press, 9781613731727, 224pp. There was never anything calm about Vincent. Her sisters used to say that she had a bee chasing her. Edna St. Vincent Millay (1892–1950), known as Vincent, was an acclaimed American poet who came to embody the modern, liberated woman of the Jazz Age. From the fiery energy of her youth to the excitement and acclaim of her early adulthood in New York and Paris, to the demands of living in the public eye, Vincent’s life was characterized by creativity, hard work, and passion. A Girl Called Vincent traces her incredible journey from a unique and talented girl to an international celebrity and Pulitzer Prize–winning poet. Raised in poverty in rural Maine, where she was often the sole caretaker of her two younger sisters, the rebellious, creative, red-haired Vincent always found time for writing, acting, singing, and playing piano. She became a sensation in young adulthood, bewitching audiences with her words, voice, and luminous appearance. She mixed with the literary figures of her time and broke many hearts. Her volumes of poetry were enormous bestsellers and audiences nationwide went wild when she recited her works onstage. In addition to poetry, Vincent’s body of work includes plays, translations, and an opera, and ranges from love sonnets to antiwar propaganda. 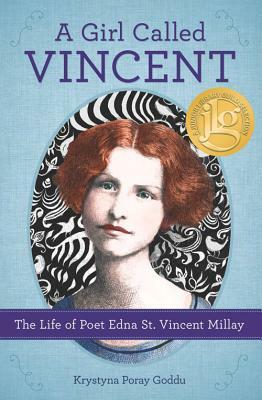 Packed with photos, poems, letter and diary excerpts, a time line, and bibliographic notes, A Girl Called Vincent is an eye-opening and valuable addition to any young reader’s or aspiring writer’s bookshelf. Krystyna Poray Goddu holds a degree in comparative literature from Brown University. Author of Dollmakers and Their Stories: Women Who Changed the World of Play, she has contributed to American Girl magazine, the New York Times Book Review, and the Riverbank Review of Books for Young Readers and is a regular reviewer of children’s books and writer for Publishers Weekly. She has worked at Woman’s Day magazine and was founding editor of Dolls magazine and cofounder of Reverie Publishing Company, which publishes books on dolls and toys for collectors and children. She has also worked in school libraries and taught writing to middle-school students in independent schools in New York City.